Would it surprise you to know that the WorkHuman Research Institute that revealed that 21 percent of employees have NEVER been recognized at work and 33 percent haven’t been recognized in 6 months? Even those employees who don’t thrive on recognition, need more attention than that! 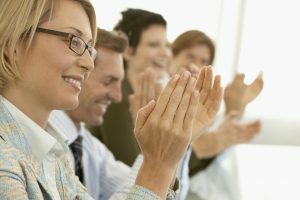 We must do a better job creating an emotional connection with our employees by acknowledging, appreciating, and applauding their efforts. Can you ever over-thank an employee? Not if you’re specific and sincere. If you finish reading this article thinking, “That Lisa Ryan woman said I need to thank five people today. Okay. “Thank you,” “thank you,” “thank you,” “thank you,” “thank you.” Check! That’s done.” You’re right; it doesn’t work. Your employees will see right through your lack of sincere effort. On the other hand, what gets recognized gets repeated, so the more specific you can be in your acknowledgment, the better it is. You can either say a generic, “Good job, Maria.” or you can tell her, “Maria, you did an outstanding job handling that call with Mrs. Smith today. She was tough in her demands, and you calmed her down, handled her professionally and solved her problem, and let us keep her as a satisfied customer. You have great customer instinct. Thank you!” Now Maria knows exactly what she did to warrant recognition, whereas, the “good job” comment, the comment was open to her interpretation. You may consider engagement strategies as a soft skill, but using these skills effectively produces hard results. In studying the communication habits of a team, Marcial Losada found that high performing teams have a 6:1 positivity ratio. That means for every one negative comment heard by a team member; they receive at least six positive responses. On an average performing team, the ratio drops to 3:1. This ratio means your engagement is barely surviving. Your employees are doing just enough work, so they don’t get fired, and you are probably paying them just enough so they don’t quit. They are rowing just fast enough for the boat not to sink. It’s an even balance. On a low performing team, the ratio is .3:1. This statistic means employees hear three times more negative comments than positive remarks. It’s kind of like being in bumper-to-bumper traffic. For every one person who waves “Go ahead,” THREE people are honking their horn and making obscene gestures! Stop always trying to “fix what’s broken” and strive to recognize the excellent work that your employees do. In its research, the Gallup Organization finds that only 30% of your employees are actively engaged. These are the people that bring more value to your organization than the salary you are paying. About 50% of your employees are disengaged. They are doing precisely the amount of work they are paid to do – nothing more, sometimes less. And, of course, you have your bottom 20% – the actively disengaged employees. These are the poisonous, toxic, “problem children” who work for you. Not only are they a pain to be around, but they are expensive – costing you as much as $3500 for every $10,000 in salary. When your toxic employees start causing people to leave, who leaves? Your best employees or your worst? The best, right? It’s a negative spiral that must be taken care of – even if you must offer that employee the opportunity to find another job. Think about the two groups of employees who get all of the attention – the actively engaged “rock stars” and the actively disengaged “problem children.” Let’s take a minute and consider the forgotten group – the middle 50%. We’ll call them your “Steady Eddies.” Eddie might not be a rock star, but he’s not a problem child. He comes to work, does his job, and goes home. What if one day, you said to him, “You know Eddie, I want to let you know how much I appreciate your being here every day, I can always count on you. Thanks!” Eddie might be thinking, “Hmmm, how do I get more of that?” So he works a little harder because he likes the positive attention. And you’ve opened the door for him to perform BETTER…and you may have given him what he needed to move closer to “Rock Star” status. One final thought to keep in mind – where do your actively disengaged employees get their recruits? From the middle 50%. The 50% is the group you can have the most impact on, with the right encouragement. They are the group where you can make the most significant difference. If your employees have not heard a positive word from you in the past week, look for something specific you can acknowledge. Who knows, you may stop that person from clicking “send” with his or her resume to another potential employer.